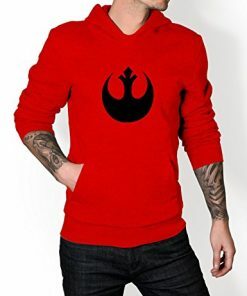 Star Wars Rebel Hoodie is available in red color with logo imprinted on the center of the chest in black. Made from cotton and polyester material. A great option to switch to a new color when it comes to a hooded sweatshirt. The pouch pocket is in the center for convenience. Overall the hoodie’s red color with black logo gives striking looks when worn. At just 39 dollars, this sweatshirt is a bang for the buck. So skillfully made that even I can’t resist writing this review. I would recommend this outfit to everyone as it’s the best mix of price and quality. Crazy fan of star wars..?? Get Ready to bring back the justice with this Star wars Rebel hoodie from the movie. Feel proud to carry this logo from Star Wars Rebel movie on your outerwear. Black logo on the red background makes it more clear. Grab it, wear and identify yourself as a real fan. No doubt it will keep you warm in winter season and without a doubt extremely pleasant too.